Home » Eye Care Services » Dry Eye Disease and Treatment » Do You Suffer from Dry Eyes? Your tears comfort your eyes in many ways. Water moisturizes; an outer layer of oils lubricates and prevents evaporation, and proteins help protect against infection. Dry eye strikes when your eyes can’t produce enough tears for lubrication or the moisture in your tears evaporates too quickly. Dr. Boaz Schwartz provides you with excellent care and expert treatment your dry eye syndrome. An overwhelming number of individuals in the US suffer from the irritating symptoms of dry eyes. Estimates put this amount at more than five million people! While everyone’s symptoms are unique, the most common signs are a constant stinging or burning in your eyes, a scratchy feeling, and/or the need to keep blinking and rubbing your eyes. Pink or red eyes are also typical, and wearing contact lenses is often impossible. Dry eyes do not usually pose any danger, yet they are certainly annoying and may disrupt many of your daily tasks. If these symptoms are familiar to you – there’s no reason to suffer. At our Mount Airy optometry practice, Mt. Airy Medical Eye Center, we’re experienced and skilled in diagnosing and treating dry eyes. Please contact us to schedule an appointment with Dr. Boaz Schwartz. The best way to decide upon an effective dry eye treatment for you is to first identify the source of the problem. Dry eyes can be caused by a number of culprits, and based on the results of our eye exam along with information about your lifestyle, we’ll advise the most suitable dry eye treatment. What are some common causes for dry eyes? How do we diagnose Dry Eye Syndrome in Maryland? Diagnosing dry eye requires a comprehensive eye exam. During this time, our eye doctor may do a few tests to help with the diagnosis including InflammaDry. 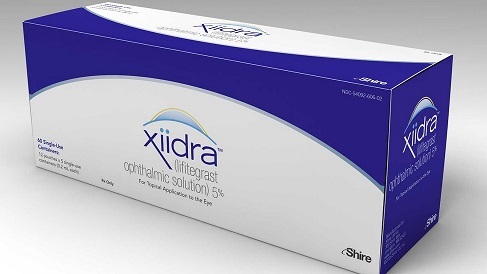 This test represents the innovation being made in dry eye diagnostic technology. It is completed in-office with results given before you leave the office. InflammaDry is a quick test used to look for an inflammatory marker in tears called MMP-9. People who have higher levels of this specific marker are more likely to have dry eye. Our Mt. Airy eye doctor uses the InflammaDry device to collect a sample of your tears and within 10 minutes a blue or red line will appear to illustrate whether the results are positive or negative. What are some effective dry eye treatments? There is no cure for dry eyes, yet we can offer many strategies and treatments to help alleviate your pain and discomfort. In our Maryland eye center, we’ll personalize a treatment plan to meet your health condition and lifestyle needs. Your own real tears are a real possibility. RESTASIS®—the one and only prescription medication FDA-approved to help you make more of your own tears —is available in a multidose bottle. RESTASIS® and RESTASIS MultiDose™ help increase your eyes' natural ability to produce tears, which may be reduced by inflammation due to Chronic Dry Eye. RESTASIS® and RESTASIS MultiDose™ did not increase tear production in patients using anti-inflammatory eye drops of tear duct plugs. Our optometrist in Mount Airy, MD is really excited about a new procedure and new product for patients with Blepharitis (inflammation along the eyelid margin) or Dry Eyes. 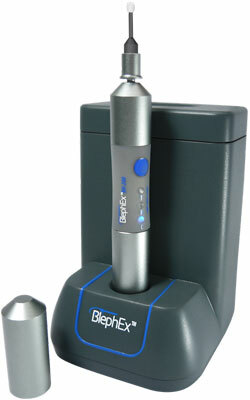 We are now performing microexfoliation of the lid margins/lash area with an instrument called BlephEx. This procedure eliminates the biofilm associated with Blepharitis and Dry Eyes. It works very well to reduce associated irritation, redness, inflammation and dryness. 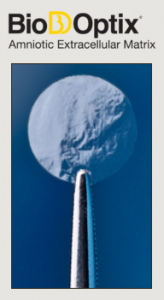 BioDOptix® is a dehydrated, extracellular membrane allograft derived from human amniotic tissue for use as a scaffold for ocular tissue repair and regeneration. Biod-Optix, a revolutionary new technology that utilizes the amazing healing power of embryonic tissue to heal corneal abrasions, infections and other potentially damaging and painful corneal conditions. Corneal abrasions, infections, and malformations can be very painful and may cause serious long-term damage to your vision. Infections like corneal ulcers, recurrent corneal erosion, severe dry eye, like corneal abrasions, or chemical burns are some of the conditions that benefit from this type of corneal treatment. Risks of this procedure are very low and involve inflammation from the membrane placement on the eye. If problems present the membrane is removed and the underlying condition is treated by other means. Eye lubricants and specific anti-inflammatory medications may help stimulate and enhance the production of your tears. We may also prescribe antibiotics to decrease the bacteria in your eyes that damage natural, healthy lipids. Artificial tear inserts slowly release moisture into your tear film. These are inserted in the same manner as contact lenses. How can you help resolve your dry eyes at home? Over- the-counter solutions, such as artificial tears may relieve dryness. Check with our Mount Airy optometrist about the specific brands that are suitable for you. Drink enough! Staying well hydrated can help. If you experience the symptoms of dry eyes and want relief, contact us to schedule an appointment in our convenient Mount Airy, MD office.Dr. Boaz Schwartz stays current with all the latest dry eye treatment, and we’ll help restore your comfortable vision!